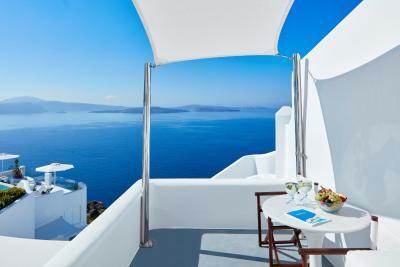 Lock in a great price for Canaves Oia Sunday Suites – rated 9.6 by recent guests! I was living in dreamland! Staff were super professional , organized. Caring and u can sense it from emails before ur arrival. Excellent room service, staff, location. 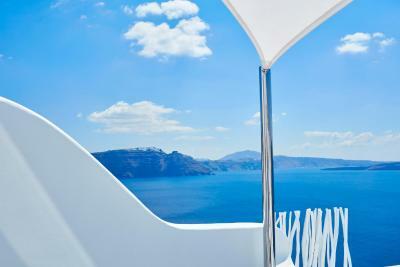 They have great view for Oia sunset, u can see it from the bar area. Service is 7 stars not as a 4 stars hotel. They upgraded our room and the coffee bar snacks were all free! Every night and find something cute. Like pillow lavender spray or candles with flowers. The hotel got only 8 rooms. So private and quite They make u feel so special this hotel worth every single dollar! they also gave us a mobile phone to facilitate anything we need. Reservation or transportation..etc. no words left to describe how amazing my experience was with canaves! Great experience, great honeymoon, great birthday, a lot of thanks to Cannavas team, special thanks to Desi and Luisa. We will come back again!!!! Everything!! It was our honeymoon and the staff made us feel extra special! The rooms are extremely comfortable and well equipped, the facilities (pool, restaurant and lounge bar) may have the best views in Oia. Louisa, the manager, had awesome restaurant recommendations (she suggested restaurants based on food quality rather than prestige or views, and she was right always: the food was incredible!). 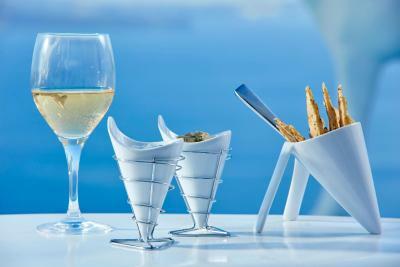 The drinks at their Veranda lounge and restaurant are both original and great. The food of both the restaurant and the breakfast was awesome too. 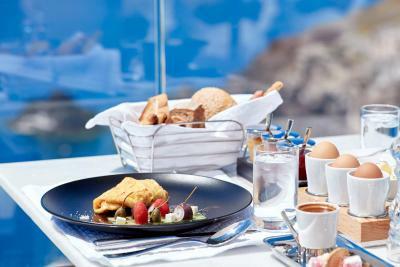 In fact, it may be the best breakfast menu i’ve seen: abundant, varied and excellent taste! 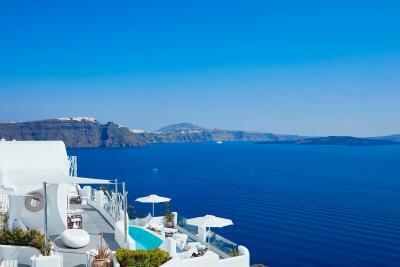 If we ever go back to Oia, we will definitely repeat our stay here! 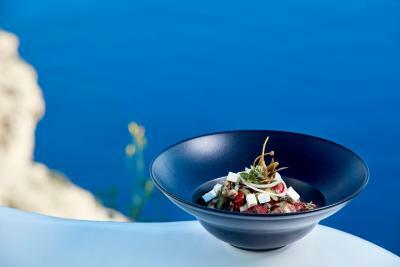 Everything about Canaves Oia Sunday Suites was fantastic. We got engaged here, and the staff went absolutely above and beyond to make the proposal special, specifically the property manager Louisa and the front desk attendant Visiliki. 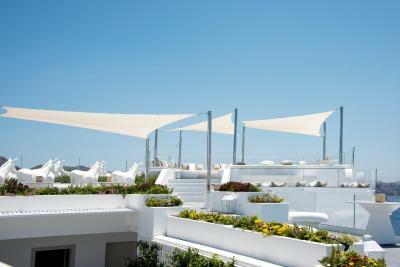 The property itself is incredibly clean, well managed, and beautiful. 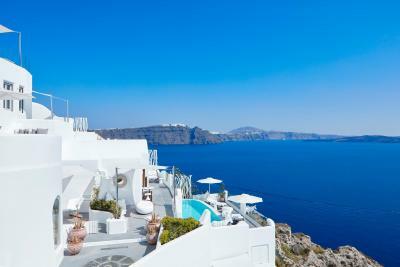 The property was one of the most private in Oia, as there were no other hotels or restaurants that had a view into the suites or the pool (which was lovely). 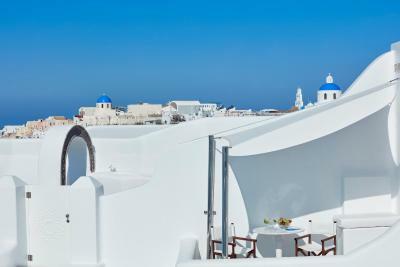 We are confident there is no better place to stay in Oia, and we will definitely be back! ABSOLUTELY the BEST hotel I've ever experienced. 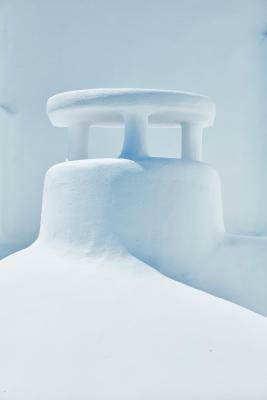 My husband and I stayed there for our honeymoon. 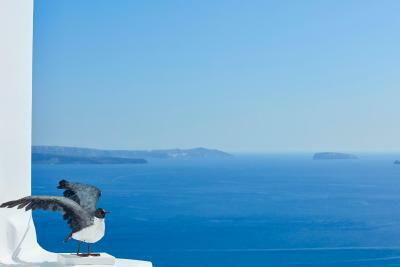 The view was phenomenon and unbeatable. The staff is super friendly and willing to help. Every single one of the staff is so professional and well-trained. 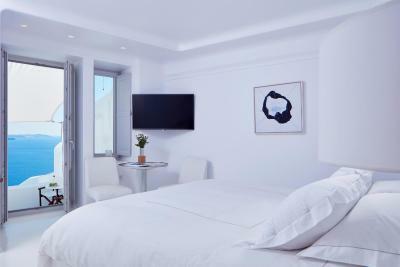 The room itself is very comfortable and detail-oriented: modern design, complimentary water/juice in the fridge, Hermes products in the bathroom. I would rate the room 100 stars if I could. The location is super ideal too. Close to bars, restaurants and stores. Highly recommend the hotel, without any doubt. Everything was amazing! It's the first time I leave a review thats how great the stay was! Especially the private heated pool in our master infinity pool room was very much needed since it was in October when we were there it does get a little chilly at night. The staff were very friendly and helpful. The view from our room and the hotel was incredible. I would definitely go back! 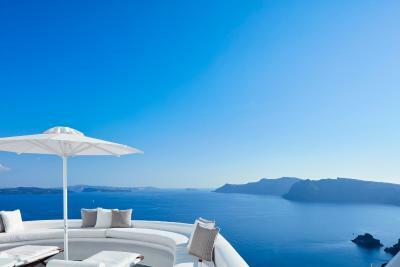 The best service and staff I have ever seen as a luxury traveler!! 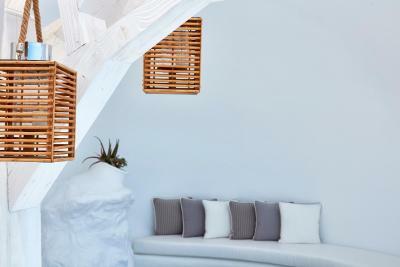 Sunday Suites is a small boutique hotel with 8 suites in total so you get a great service, privacy and super comfort. Our stay in particular was made memorable and most comfortable by the Front Desk In-charge Vicky. She is genuinely the most efficient and helped us get whatever we needed during our stay. Other staff members were also cordial and treated guests well! The room was unbelievable. 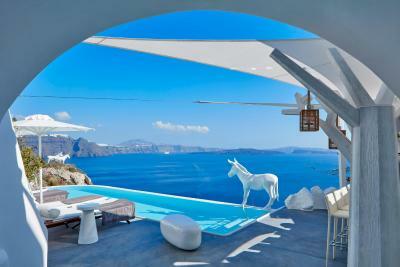 Unreal view! Staff were very helpful! The breakfast was to die for!!! 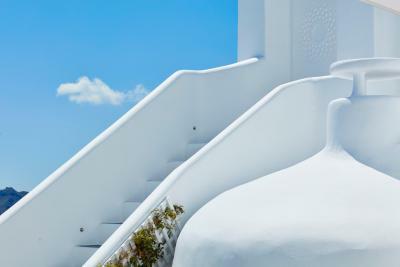 Canaves Oia Sunday Suites This rating is a reflection of how the property compares to the industry standard when it comes to price, facilities and services available. It's based on a self-evaluation by the property. Use this rating to help choose your stay! 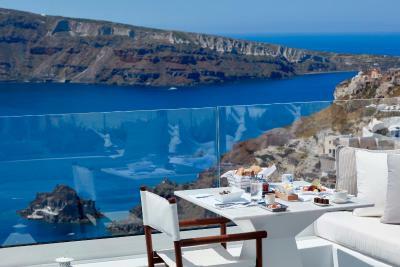 The 4-star Canaves Oia Sunday Suites, is located in Oía. 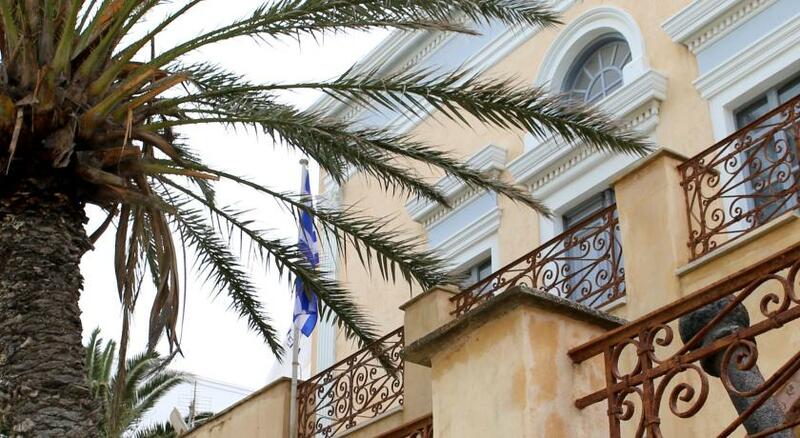 Featuring free WiFi, the hotel has a bar and on-site dining. Free private parking is available on site. All units are fitted with a flat-screen TV with satellite channels, a coffee machine and a wardrobe. 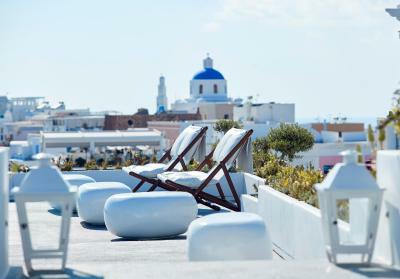 Featuring a private bathroom with a bidet and bathrobes, certain rooms at the hotel also offer a terrace. 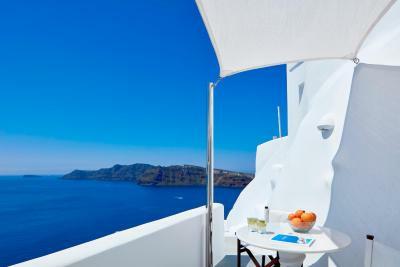 Rooms at Canaves Oia Sunday Suites include bed linen and towels. Every morning full english/irish breakfast is served at the property. The accommodations offers an outdoor pool. 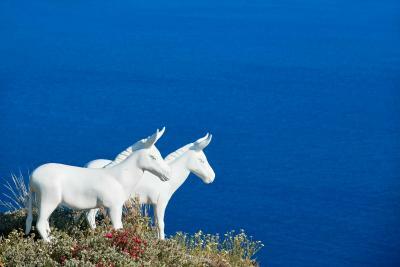 Bike hire is available at Canaves Oia Sunday Suites, while the area is popular for cycling. 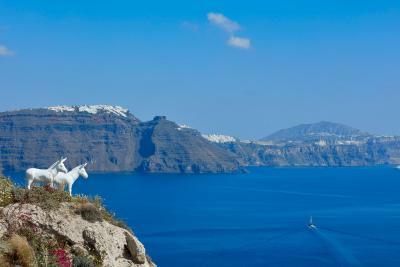 Cape Columbo Beach is 2.5 mi from the hotel, while Santorini (Thira) Airport is 6.8 mi from the property. 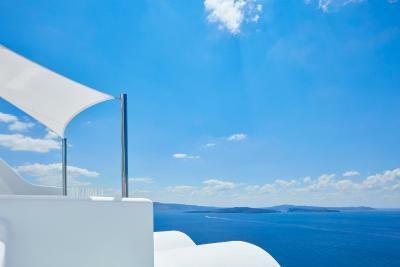 When would you like to stay at Canaves Oia Sunday Suites? 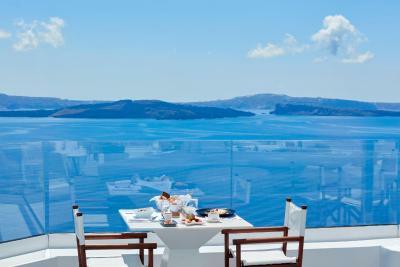 Opening to a terrace with an outdoor plunge pool and panoramic Caldera view, this suite has a spacious bedroom, an open-plan living room, and a bathroom with round shower area including 2 showers. 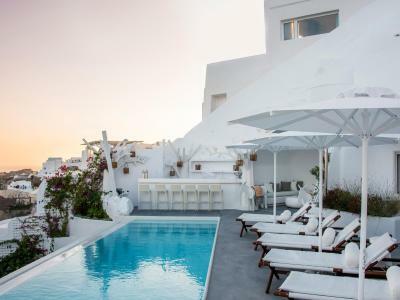 House Rules Canaves Oia Sunday Suites takes special requests – add in the next step! 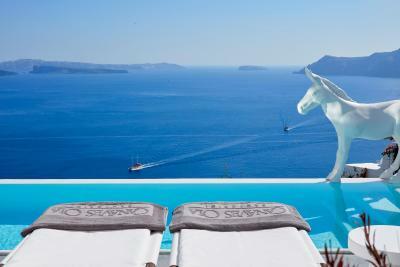 Canaves Oia Sunday Suites accepts these cards and reserves the right to temporarily hold an amount prior to arrival. 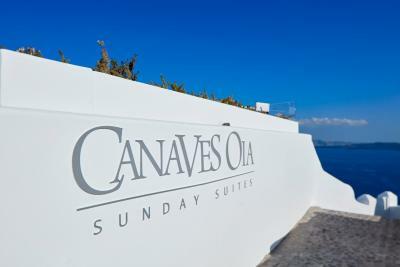 Please inform Canaves Oia Sunday Suites of your expected arrival time in advance. You can use the Special Requests box when booking, or contact the property directly using the contact details in your confirmation. Honestly can't think of anything we disliked! I was upgraded to the Master Suite which was rockstar incredible. 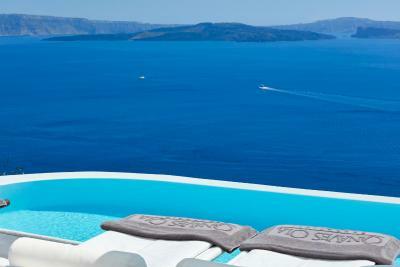 Not only did I have the picture perfect views of Santorini, I had a private swimming pool. 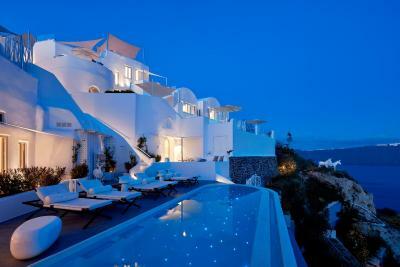 This is a complex of 6 suites and the rooms are luxurious. The staff are very attentive. 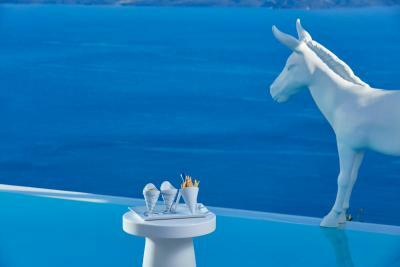 The rooftop bar perfect to watch the famous Santorini Sunset. 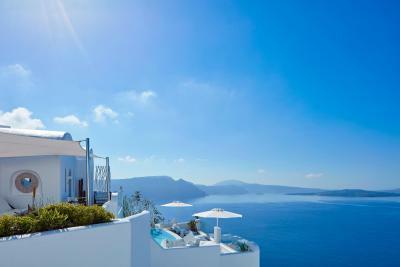 This is the perfect place to enjoy the beauty and serenity of Oia in a private oasis. I was worried about travelling on my own which was not an issue at all. My first 10 Rating! 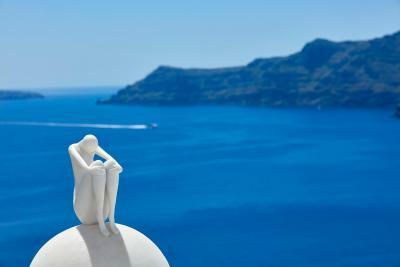 The location is incredible - you get the picture perfect views. I was upgraded to a Suite with a Cave Pool and private terrace. Truly amazing, loved everything. The room was stunning. 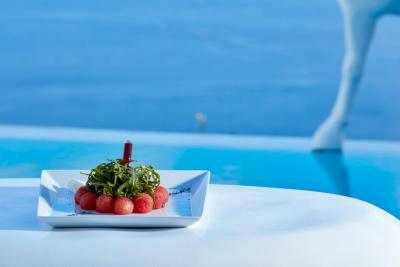 The staff are friendly and attentive, breakfast is great and delivered to the room. The Manager John came to say hi and was very welcoming. Would return in a heartbeat! 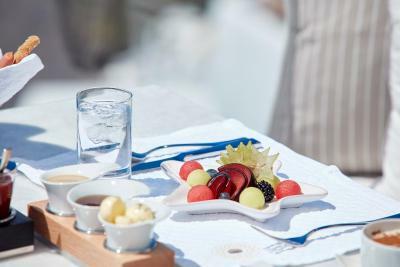 The hotel is gorgeous, beautiful views, nice pool area, rooms are big and comfortable, breakfast can be served at the deck area (amazing views) or at your room and there is an extensive menu. Food was very good. Staff was extremely helpful with anything we needed (from car hire to restaurant bookings, carrying heavy luggage around the place etc). 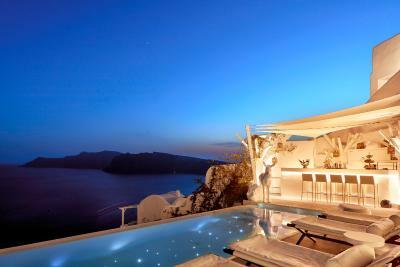 Location is excellent - in the heart of Oia. We would definitely come back. Pool very small. Only 7 chairs for all guests to use. Balconies not ideal. Too few staff for breakfast etc so never get food on time. Location.. location.. Location... Staff is amazing and very attentive to details.. Shout out to Louisa the manager... she is superb. 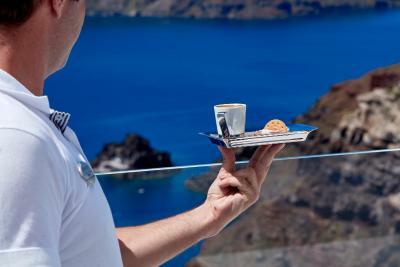 The bed and the view were glorious... Breakfast on your balcony looking out at the Caldera is priceless. Can't wait to go back. Highly recommend.... 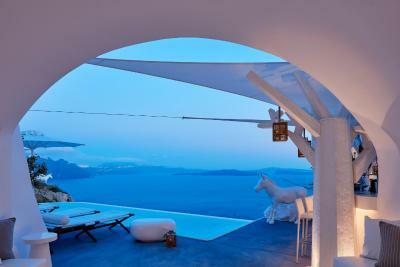 It doesn't get better than this in all of Santorini. We loved every minute of our stay. The service was incredible, the cocktails were sublime and the views sensational. Nothing, everything was so amazing! Everything was perfect. 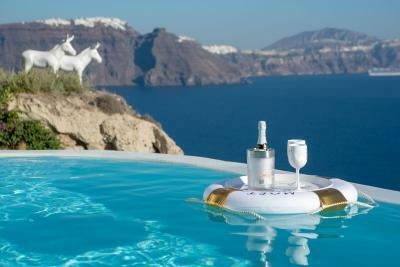 Really, they managed to creat the perfect luxury resort experience!